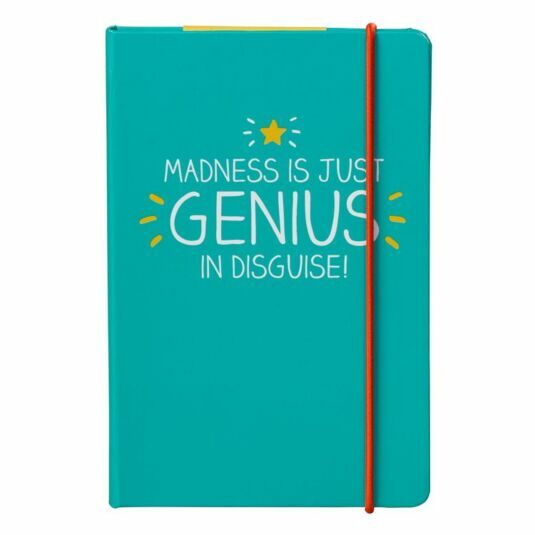 MADNESS IS JUST GENIUS IN DISGUISE! Inside, the endpapers are bright yellow, with a pattern of white squiggly lines and matching yellow page edges. There is space on the front page for the owner’s name and address, and the pages are printed with useful lines. The book is completed with a paper pocket inside the back cover for useful scraps of paper, tickets and other ephemera and the book is held closed with a red elastic band. This little booklet makes a great gift for a birthday, Christmas stocking filler or to simply say thank you!